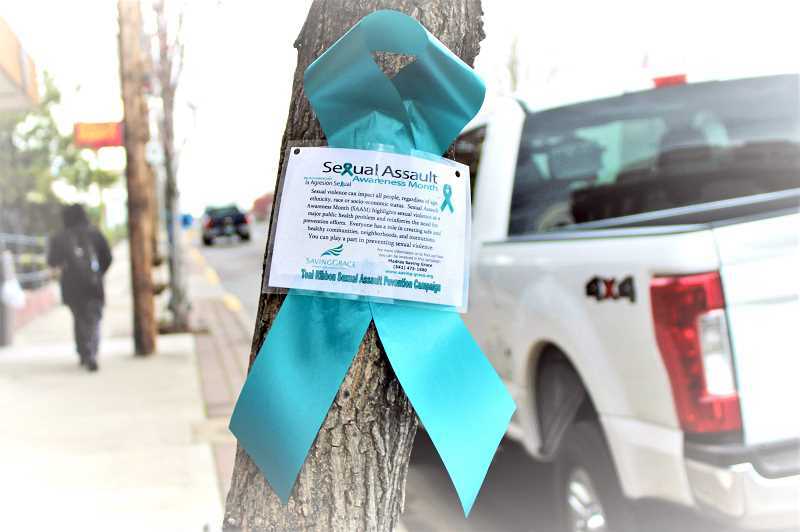 Saving Grace is spreading sexual assault awareness and teal ribbons around Madras. April is Sexual Assault Awareness Month and Saving Grace is spreading awareness around Madras. The Bend-based organization provides comprehensive family violence and sexual assault services throughout Central Oregon. In order to get the word out about Sexual Assault Awareness month in Madras, Saving Grace has organized its annual Teal Ribbon Campaign, during which they distribute small teal ribbons — the color associated with Sexual Assault Awareness Month — to community members to be worn throughout the month. The organization also places large teal bows on trees downtown, at city hall and at the Jefferson County Sheriff's Office and jail. The Sheriff's Office, along with the Jefferson County Adult Parole and Probation Office and Madras Police Department also participate by placing teal ribbon magnets on their cars for the month. Saving Grace is also participating in Week of the Young Child from 10 a.m. to 1 p.m. Saturday, April 13, with a booth and coloring station at Sahalee Park. The organization will also be giving a presentation to the staff at Mosaic Medical later in the month on the sexual assault services Saving Grace provides.